If you don't spoil the solutions, Please, Don't Touch Anything is an enjoyable little puzzle box full of cute, if not meaningful, surprises. What is it? A puzzle room full of pixel art surprises. Please, Don't Touch Anything is a puzzle game in 25 megabytes. It's $5/£4, and all there is to it is a pixel art terminal—though that slate grey surface contains many more moving parts than it first appears. 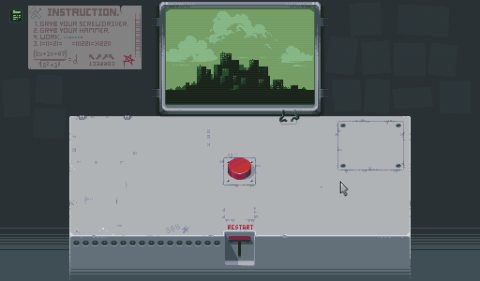 The oppressive-looking desk job reminds me of Papers, Please (and so does the 'please,' obviously), but PDTA's sense of humor makes it a bit more like The Stanley Parable, if you reduced Stanley's repetitious adventures into buttons and switches. The narrator in this case is a colleague who tells you not to touch anything before shuffling off to the bathroom. The first thing I did is start pressing buttons, naturally. PDTA is about unraveling the odd workings of a convoluted machine to activate surprises. Most of the puzzles require thorough study of the brief, cryptic instructional poster in the upper left, as well as enough curiosity to try, err, and try again. 'I'm just going to do this to see if anything happens' is the best way to discover the simpler solutions, and always a good idea when left unattended with machinery. There's not much 'content' in the traditional sense, but that's a word I revile anyway. The 'content' is what you do: PDTA is a puzzle box, and the things inside the box (brief animations, mostly) will only disappoint if they don't come as a surprise revealed by fumbling through the solutions. There's a complete guide on Steam, but just glancing at it deflated a lot of the mystery for me. So, don't do that. I'm mostly disappointed that PDTA isn't as thoughtful as the games I've compared it to, even though its construction could support an interesting narrative. The Stanley Parable, for instance, was a comment on free will and the nature of game design, while Papers, Please had a hell of a lot to say about bureaucracy, dehumanization, and survival. In contrast, PDTA feels empty. Its endings are disparate, common pop culture references—a little funny, but well-tread. None of them are thematically related or build any kind of mythology, say, in the way Five Nights at Freddy's has with a similarly bare set. The great soundtrack and clean little pixel animations are absorbing, but still nothing elevates PDTA above a puzzling toy with gags that spring out of the lid when you find the right combination. But taken for what they are, the gags are cute and, more importantly, finding the combinations to unlock them is fun. Some of the puzzles don't require much in the way of logical reasoning—they're just a matter of figuring out which numbers apply to which buttons—which is a little disappointing, but some of the harder ones are maddening. It's also delightful, and a little eerie, to experiment in ways that seem pointless and then to discover that someone actually predicted you'd do that. Surprise solutions are PDTA's reward, making it essentially a game about finding the well-hidden Easter eggs you might stumble upon accidentally in another game, and fodder for achievement hunters. Cheap as it is, I can see why an egg hunt might feel underwhelming for five bucks—at least one Steam reviewer complains that it's better suited for a free Flash game site—but I'm happy that we have an environment where not every game needs to be a prodigious undertaking to be worth paying the creator. Please, Don't Touch Anything may be a small whole, but it's a whole experience, confidently animated (in brief spurts) and executed with care, and with a soundtrack (available to download for an extra dollar) I heartily recommend. At a time when I'm feeling a bit exhausted by half-finished behemoths, all with tangled lists of planned features, unfolding Please, Don't Touch Anything's little machine was pleasantly isolating and captivating.